When you start comparing actual numbers, you can quickly see that one scoop of PULSE — ½ of a serving — contains about double the effective ingredients of our best competitors. And a full serving, which provides you with clinically effective dosages, is double that. While everyone claims to have the best products on the market, we believe we can actually back up such a claim with real science and real numbers. Compare the PULSE formulation to any other pre-workout drink on the market, and it’s easy to see how inferior our competitors’ products truly are. If you want to know what a pre-workout is supposed to feel like…if you want to experience the type of energy rush and performance boost that only clinically effective dosages of scientifically validated ingredients can deliver…if you want to avoid any potential issues arising from regular intake of artificial sweeteners and food dyes…then you need to try PULSE. 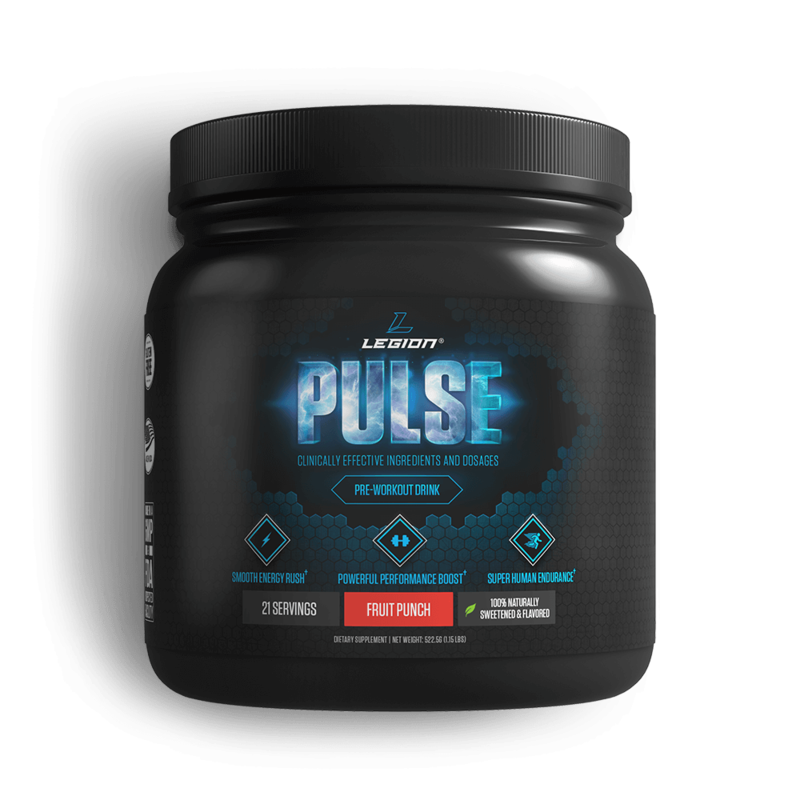 PULSE is a 100% natural pre-workout that increases energy levels, improves mood, sharpens mental focus, boosts strength and endurance, and reduces fatigue. The clinically effective dosages of caffeine and theanine will give you a smooth surge of energy and focus , and the beta-alanine, citrulline, betaine, and ornithine will give you bigger pumps and more strength and endurance. What PULSE won't give you are the jitters, nausea, or dreaded post-workout crash that are so common with other pre-workouts. It’s also 100% naturally sweetened and flavored and contains no artificial food dyes, fillers, or other unnecessary junk. 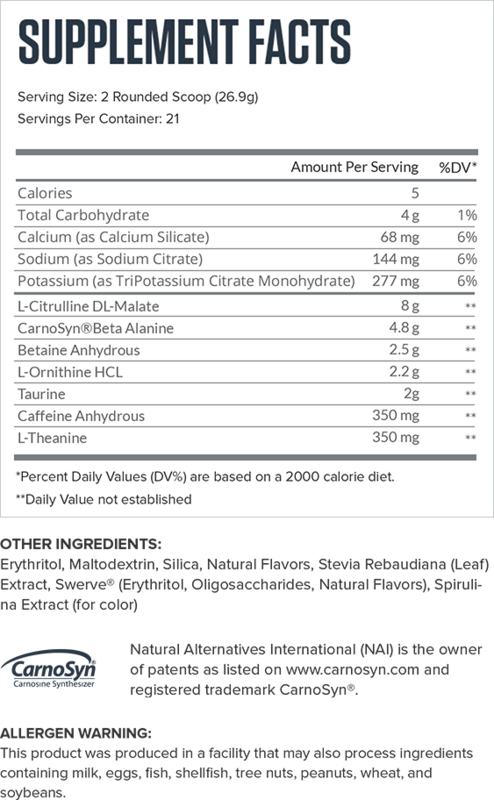 All that is why it’s the #1-ranked pre-workout on Labdoor, and why it has over 3,100 reviews from customers on Amazon.com with a 4.5-star average, and another 600+ on our websites, also with a 4.5-star average. What PULSE is not, though, is cheap, so if you’re concerned about the price, I understand--you can get a pre-workout for a bit less. Remember that you get what you pay for, though, so generally speaking, the cheaper a supplement is, the less effective the formulation. Place your order now and if you don’t absolutely love PULSE, just let us know and we’ll give you a full refund on the spot. No complicated forms and no return necessary. Many of us can’t shake the cobwebs without our morning cup of coffee, but this powerful compound is a lot more than a mere pick-me-up. PULSE contains 350 mg caffeine per serving. Pulse contains 350 mg of L-Theanine per serving. Citrulline malate is the amino acid L-citrulline bound with malic acid, a natural substance found in many fruits that is involved in the creation of cellular energy. 2. It’s the form used in most studies demonstrating the performance benefits associated with L-citrulline. Clinically effective dosages in the studies cited above range from 4 to 10 grams per day. 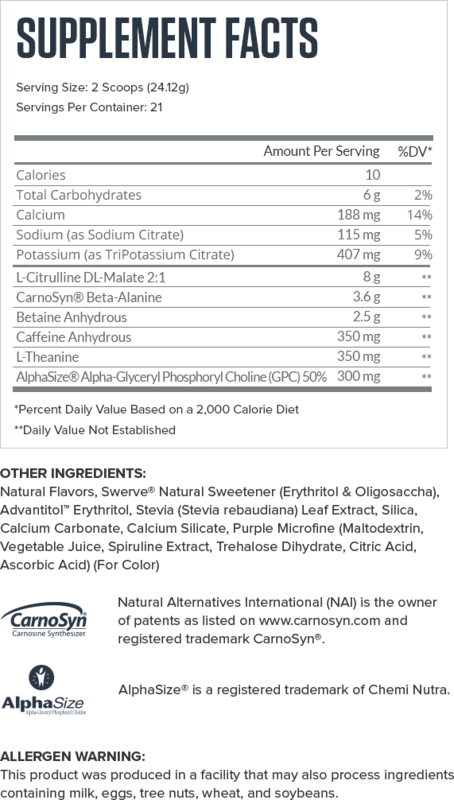 Pulse contains 8 grams of Citrulline Malate per serving. One of carnosine’s roles in our muscles relates to the regulation of acidity levels. 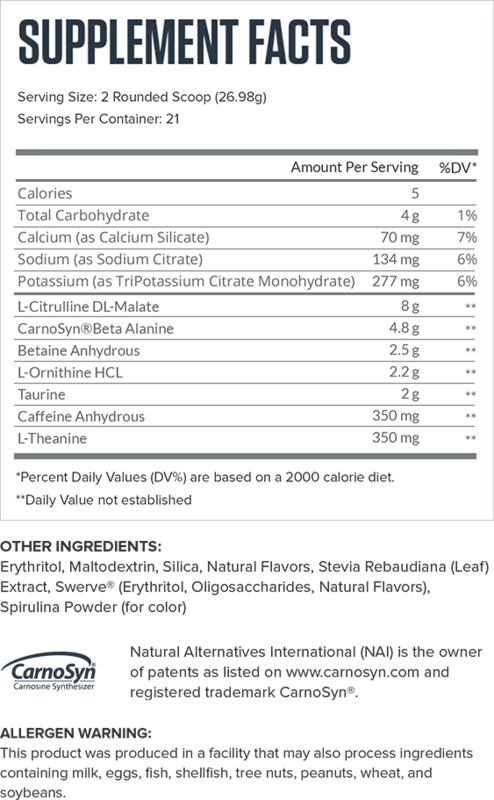 The clinically effective dose of beta-alanine ranges from 2.6 to 6.4 grams per day, with a median effective dose of about 5 grams per day. 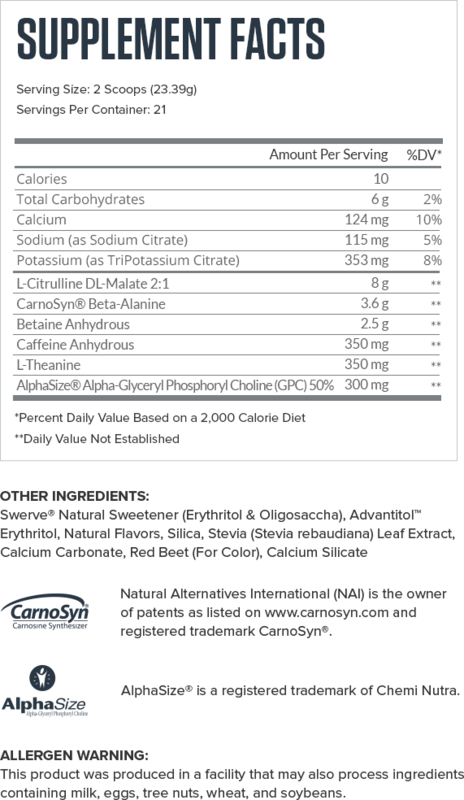 Pulse contains 4.8 grams of Beta-Alanine per serving. Due to the proper dosing of beta-alanine in PULSE, you’re likely to experience this side effect. 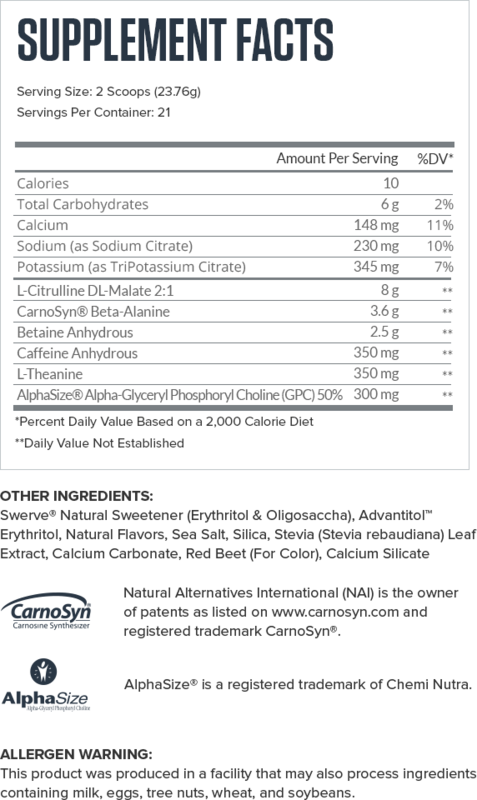 The clinically effective dose of betaine ranges between 1.25 and 2.5 grams. Pulse contains 2.5 grams of Betaine per serving. L-ornithine is an amino acid that, along with arginine and citrulline, plays a key role in a metabolic cycle known as the urea cycle. This is the process by which the liver converts ammonia into urea, which is expelled through the urine, and it affects physical performance capacity. 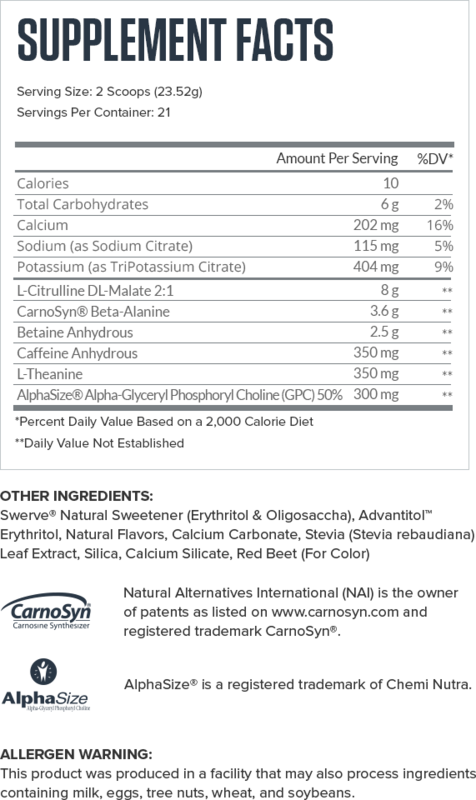 The clinically effective dose of ornithine is between 2 and 3 grams per day. 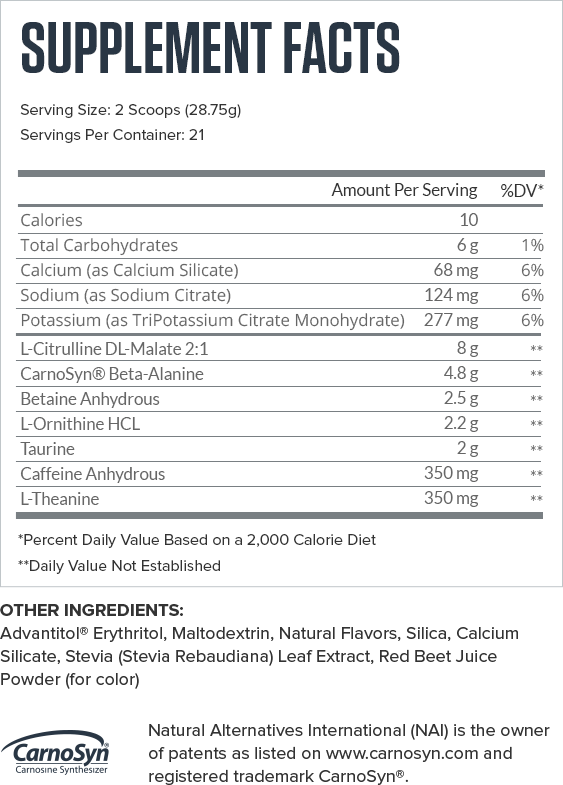 Pulse contains 2.2 grams of L-Ornithine per serving. If this is your first time using PULSE, assess your individual tolerance by mixing 1 scoop with 10-12 ounces of water and consuming 15-30 minutes prior to exercise. If you experience any non-optimum effects, stop and consult your doctor. We recommend using 1 scoop 15-30 minutes prior to weight training or intense cardio, or 2 scoops (full clinical dosages) for intense weight training or cardio lasting longer than 45 minutes. 01. Caffeine: a double-blind, placebo-controlled study of its thermogenic, metabolic, and cardiovascular effects in healthy volunteers. 02. Effect of caffeine ingestion on one-repetition maximum muscular strength. 04. Effect of caffeine on sport-specific endurance performance: a systematic review. 06. The deployment of intersensory selective attention: a high-density electrical mapping study of the effects of theanine. 07. L-Theanine reduces psychological and physiological stress responses. 08. L-theanine promotes nitric oxide production in endothelial cells through eNOS phosphorylation. 09. Psychological effects of dietary components of tea: caffeine and L-theanine. 11. L-theanine, a natural constituent in tea, and its effect on mental state. 12. Assessing the effects of caffeine and theanine on the maintenance of vigilance during a sustained attention task. 13. L-theanine and caffeine improve task switching but not intersensory attention or subjective alertness. 14. The effects of L-theanine on alpha-band oscillatory brain activity during a visuo-spatial attention task. 15. The effects of L-theanine, caffeine and their combination on cognition and mood. 16. Effects of L-malate on physical stamina and activities of enzymes related to the malate-aspartate shuttle in liver of mice. 17. Effects of caffeine ingestion on rating of perceived exertion during and after exercise: a meta-analysis. 18. Citrulline and the gut. 19. Citrulline malate enhances athletic anaerobic performance and relieves muscle soreness. 20. Citrulline malate limits increase in muscle fatigue induced by bacterial endotoxins. 21. Citrulline malate supplementation increases muscle efficiency in rat skeletal muscle. 22. Citrulline/malate promotes aerobic energy production in human exercising muscle. 23. Effects of citrulline supplementation on fatigue and exercise performance in mice. 24. Influence of oral beta-alanine and L-histidine supplementation on the carnosine content of the gluteus medius. 26. β-Alanine ingestion increases muscle carnosine content and combat specific performance in soldiers. 27. beta-Alanine supplementation augments muscle carnosine content and attenuates fatigue during repeated isokinetic contraction bouts in trained sprinters. 28. Effects of beta-alanine supplementation on the onset of neuromuscular fatigue and ventilatory threshold in women. 29. The effect of beta-alanine supplementation on neuromuscular fatigue in elderly (55-92 Years): a double-blind randomized study. 30. Short-duration beta-alanine supplementation increases training volume and reduces subjective feelings of fatigue in college football players. 31. Influence of beta-alanine supplementation on skeletal muscle carnosine concentrations and high intensity cycling capacity. 32. Effect of β-alanine plus sodium bicarbonate on high-intensity cycling capacity. 33. Six weeks of high-intensity interval training with and without beta-alanine supplementation for improving cardiovascular fitness in women. 34. Effects of beta-alanine supplementation and high-intensity interval training on endurance performance and body composition in men; a double-blind trial. 35. Effects of β-alanine supplementation on exercise performance: a meta-analysis. 36. Effects of beta-alanine on muscle carnosine and exercise performance: a review of the current literature. 37. Effects of β-alanine supplementation on performance and body composition in collegiate wrestlers and football players. 38. Effect of slow-release β-alanine tablets on absorption kinetics and paresthesia. 39. The effects of chronic betaine supplementation on exercise performance, skeletal muscle oxygen saturation and associated biochemical parameters in resistance trained men. 40. Ergogenic effects of betaine supplementation on strength and power performance. 41. Creatine as a compatible osmolyte in muscle cells exposed to hypertonic stress. 42. L-ornithine supplementation attenuates physical fatigue in healthy volunteers by modulating lipid and amino acid metabolism. 43. Splenda alters gut microflora and increases intestinal p-glycoprotein and cytochrome p-450 in male rats. 44. What made Canada become a country with the highest incidence of inflammatory bowel disease: could sucralose be the culprit? 45. Consumption of artificial sweetener- and sugar-containing soda and risk of lymphoma and leukemia in men and women. 46. Fueling the obesity epidemic? Artificially sweetened beverage use and long-term weight gain. 47. Artificial sweetener use among children: epidemiology, recommendations, metabolic outcomes, and future directions. 48. Gain weight by “going diet?” Artificial sweeteners and the neurobiology of sugar cravings. 49. Steviol glycosides from Stevia: biosynthesis pathway review and their application in foods and medicine. 50. Antioxidant, anti-diabetic and renal protective properties of Stevia rebaudiana. 51. Safety evaluation of certain food additives. 52. Effects of Stevia rebaudiana (Bertoni) extract and N-nitro-L-arginine on renal function and ultrastructure of kidney cells in experimental type 2 Diabetes. 53. Toxicological significance of azo dye metabolism by human intestinal microbiota. 54. Effects of tartrazine on exploratory behavior in a three-generation toxicity study in mice. 55. Artificial food dyes and attention deficit hyperactivity disorder. 56. Meta-analysis of attention-deficit/hyperactivity disorder or attention-deficit/hyperactivity disorder symptoms, restriction diet, and synthetic food color additives. 57. Food additives and hyperactive behaviour in 3-year-old and 8/9-year-old children in the community: a randomised, double-blinded, placebo-controlled trial. 58. Prolonged use of the food dye tartrazine (FD&C yellow no 5) and its effects on the gastric mucosa of Wistar rats. 59. Effect of food azo dye tartrazine on learning and memory functions in mice and rats, and the possible mechanisms involved. 60. Effect of food azo dyes tartrazine and carmoisine on biochemical parameters related to renal, hepatic function and oxidative stress biomarkers in young male rats.